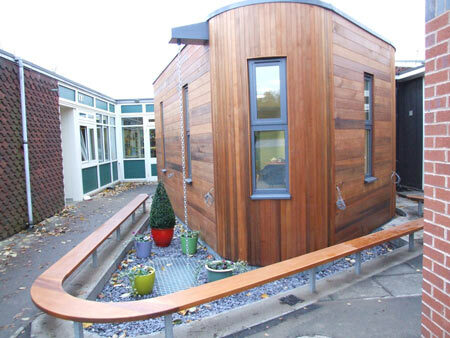 With a limited budget of £60,000 all in, the governors of Trowell C of E School approached us with a brief for a new extension to provide then with a multi-purpose teaching space as well as a quiet space for private study, one to one tutorials and a small space for ensemble music practice. The existing school is a 1960’s CLASP structure formed around courtyards on three sides. One of these spaces never worked very well as a reception space so we had the idea of filling in one space with an organically shaped building that would be seen as part art installation in formal square. This led us to design a very organically shaped building clad in cedar with small ponds and seating around it that was also designed to be seen and looked at as well as used. 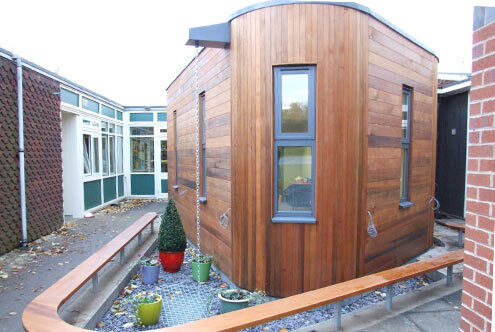 The result is a delightful, well-used building that makes very good use of space and has transformed the way the school now operates.